After a couple of winters with unusually good access to the high country on and around Mount Shasta, winter has finally come back and, while it is a great blessing that there is so much snow, it does mean there are fewer options for hitting the trail. While snowshoeing is a great option, especially around Castle Lake and Bunny Flat, many times we just want to hike a trail without dealing with snow. Fortunately, the Mount Shasta region has several options to accommodate hikers. Even better, these trails are invariably scenic and many of them have excellent views of the mountain. The reason Mount Shasta has so many options for winter hiking is twofold. First, the lowlands around the mountain are quite low. The elevation is generally below 3,500 feet. Not only does this accentuate the incredible relief of Mount Shasta but it also means that less snow generally falls in this area. This leaves the trails generally snow free. They may be blanketed at times, especially after a storm, but it usually melts off, opening the trails up quickly. The other reason there are great winter trails in the area is the presence of a large rainshadow to the north of Mount Shasta. The Shasta Valley is arid high desert terrain. It snows occasionally but this is uncommon and disappears quickly. The hikes in this area have particularly awesome views of the looming volcano. 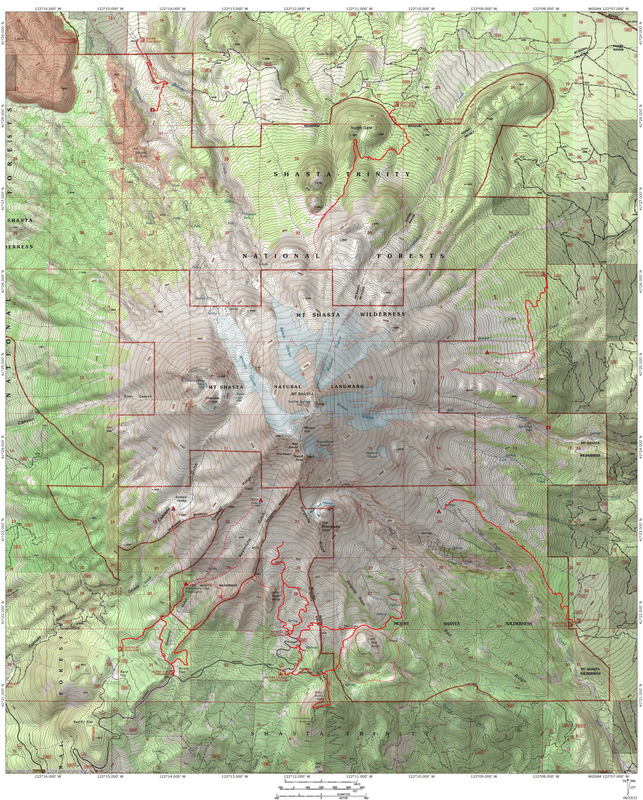 This collection will begin with the trails around Mount Shasta and then cover the hikes in the Shasta Valley. 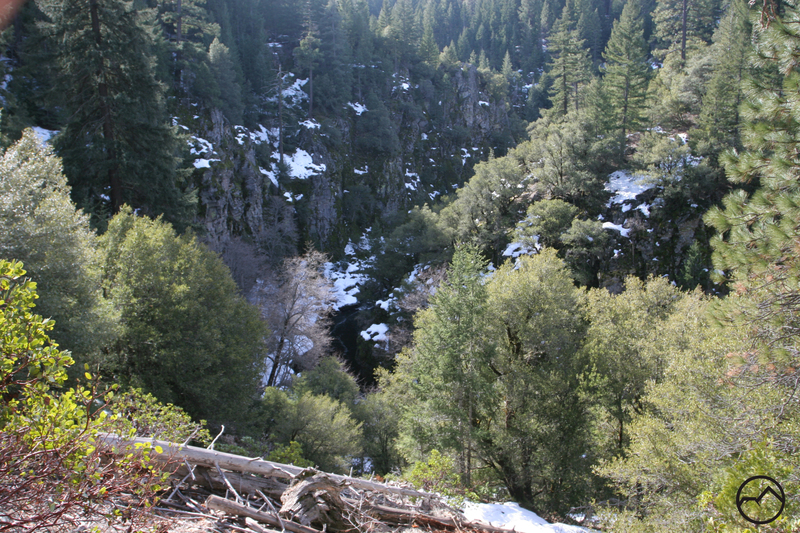 View of the Box Canyon of the Sacramento River. 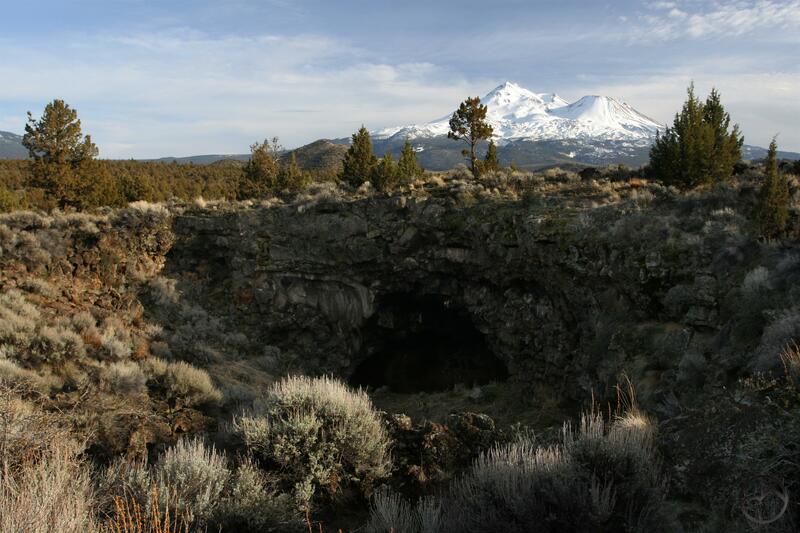 There are a few shorter trails around Mount Shasta City that offer fascinating terrain and interesting history. By Lake Siskiyou, the Box Canyon Trail and Ney Springs has beautiful canyon scenery, fascinating old ruins and awesome geology. The Box Canyon itself is an awesome but often overlooked feature while Ney Springs boasts beautiful Faery Falls. These contrast sharply with the trail up Spring Hill, which has great views of the surrounding region, especially of Mount Shasta from Rocky Point. None of these trails are particularly long, but they are great options for a chance to explore the mountains in winter. Winter view of the Sacramento River inlet. 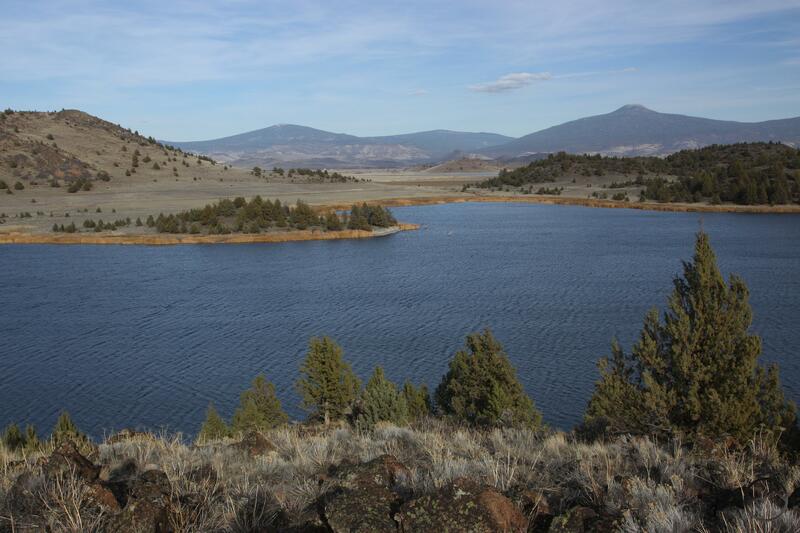 While the loop around Lake Siskiyou is a popular trip in the summer, the use is much lighter in the winter. Unfortunately, the circuit around the lake is often not possible during the winter because the bridges over the Sacramento River at the lake’s inlet are removed. 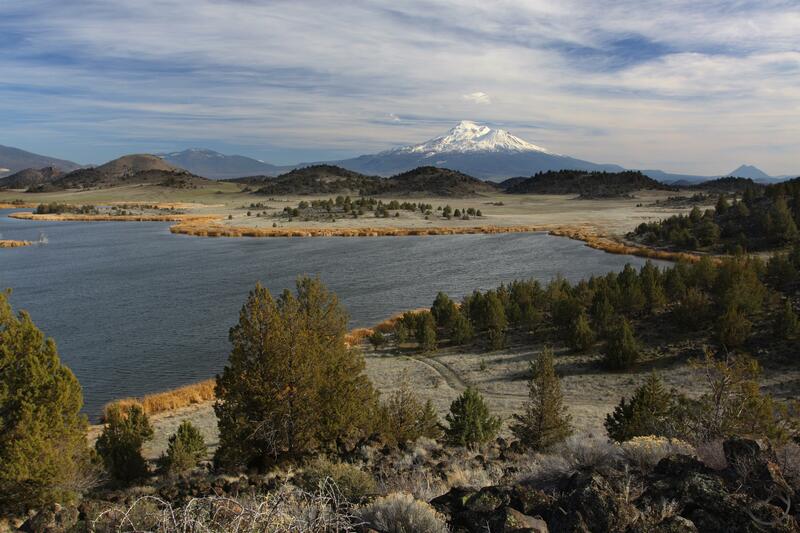 Nonetheless, the Lake Siskiyou Trail remains a great winter hiking resource. Rather than trying to do a loop, hikers can do out-and-back trips along the lake’s north and south shores. The north shore hike highlights include the Wagon Creek Bridge, some meadows and the Sacramento River inlet. This latter area is one of the pretties spots on the entire trail and has the potential for lots of exploring. The south shore has an alternate section that is one of the prettier sections of the entire loop with one of the best views of Mount Shasta found anywhere. 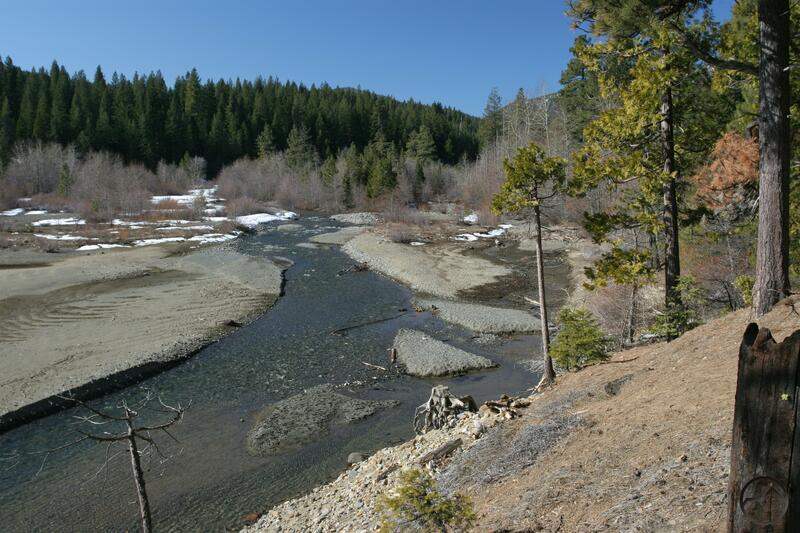 It also crosses over Castle Lake Creek and Scott Camp Creek, both of which are very attractive. The beautiful Sacramento River flows strong in winter. The Sacramento is California’s greatest river and its headwaters are one of the awesome features of the Mount Shasta area. Surprisingly there are not too many trails along this wonderful mountain river. Thankfully, “not many” does not mean “none”. The obvious highlight Castle Crags State Park’s River Trail. This scenic path crosses the river via a swinging foot bridge before paralleling the river for a mile. Along the way there are beautiful forest that include Pacific Yew, numerous creek crossings and a surprising amount of very interesting geology. Hedge Creek Falls is also great hike, though the entire trip is under a mile. It packs a lot of scenery into a short journey! The Sims History Trail is another overlooked gem with lots of room for exploring along the river. Mount Shasta and Pluto’s Cave. The high desert of the Shasta Valley is a special feature of the Mount Shasta region. Just a few miles from the alpine forests that cloak the lower flanks of the mountain lies an arid land dominated by sage and juniper. Mountains ring the valley, forming a dramatic skyline and in the winter, these peaks are white and dramatic. The views of Mount Shasta are uniformly tremendous, making this area a joy to explore. The southeast corner of the valley boasts a trio of great hikes. The highlight is the Pluto’s Cave Trail, which explores high desert lava flows and the mysterious, eponymously named lave tube cave. Though the trail on the surface is only a mile loop, the cave offers another mile of subterranean hiking. Nearby are Yellow Butte and the Haystack, which are great desert peaks and offer awesome 360 degree vistas. A day spent hiking this area is a day well spent. The Cascade Crest from Trout Lake. Little known and grossly under-appreciated, the wildlife refuge near Montague is mostly frequented by anglers and birders. However, there is great hiking to be had here. The main attraction is the path along the shore of Trout Lake. It is hard to understate just how wonderful the views and scenery is here. The rest of the refuge is explored via old ranch roads. Bass Lake and Steamboat Mountain are the most interesting destinations, as well as the Little Shasta River. The potential for a well developed network of foot trails is great but for now, the refuge experience remains ranch road bound, for the most part. Still, this area is a paradise in winter and fall. A few other winter options are worth noting. The Castle Crags can offer some spectacular winter experiences. Their prime season is in the spring but winter can still be an excellent time to hike these awesome trails. Snow does fall on many of these, so there is a good chance that some trails are inaccessible. 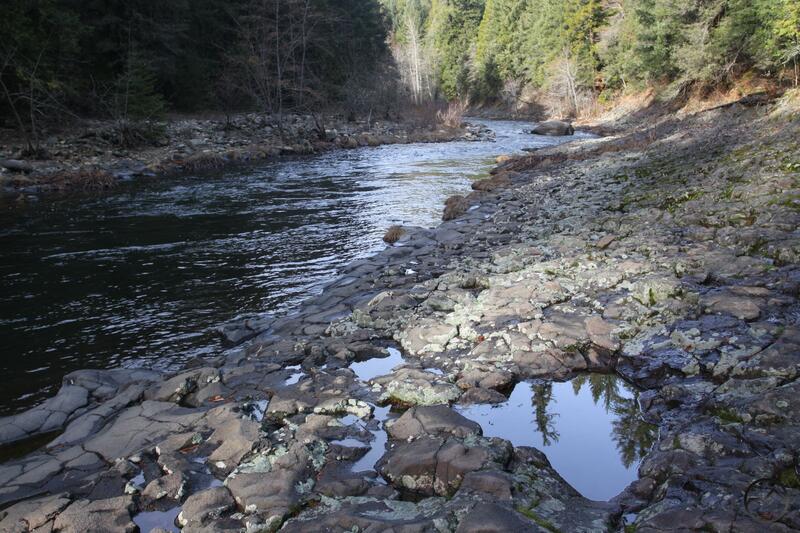 This is also true of paths on the McCloud River. At times during winter they may easily accessible. At others the trailheads are cuttoff. Spring is also the prime season for these trails too. Great post. I am always looking for new wildlife refuges to visit and Shasta sounds great with the added bonus of views of the mountain. It really is a great place, but I should note that it is not like the vast refuges in the Great Basin. It around 5,000 acres and was once an old ranch. Lots of deer and tons of birds, including pelicans. I am pretty sure there are cougars too, since I have found some kill. All the other usual suspects as well, of course. The view of Mount Shasta really is superlative and the rest of the mountains around the Shasta valley look great too!